I added the image the UK Guardian included with the article about British expats in Spain. I will include it here as well. Eggs, pork and beans, french fries, linguicia, toast, juice, coffee, and a couple items I didn't recognize. 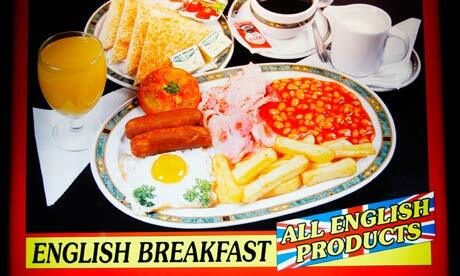 Never knew what an English breakfast was but maybe this is the Spanish version of that. When we visited Spain for most of the month of September, 2002, we had a wonderful time. However, there were two things we found hard to adjust to. One was the Spanish meal hours (dinner at 10 p.m., or later) and the skimpy breakfast fare. Our better lodgings included breakfasts, but that usually consisted of coffee, perhaps a small glass of juice, and toast. The toast was often smeared with margarine and grilled on the plancha. There was usually marmalade, peach the most common. Fortunately, we found a bar in Madrid that served small sandwiches of "pan Chabatta" with a choice of salami. jamón or sardinas. There were also large, greasy churros and "porros", a larger and greasier churro. After a few days of truly skimpy breakfasts and awful suppers at an otherwise charming B&B in the Merindades of Burgos province, we drove to Reynosa, Cantabria, where we lucked out. It was a cafetería and bakery called "El Vejo", which understood what Anglo travelers wanted for breakfast. We stoked up on lomo adobado, huevos, papas and jugo de naranja as well as the excellent strong coffee. Similarly, when we based ourselves in the mountain town of Arenas de Cabrales, Asturias, we found another restuarant where we could have British style bacon and eggs. It was a lifesaver. But I did pick up a few worthy Spanish breakfast habits. One was a a strong black coffee "corrected" with a splash of anís. All I lacked was a cigarette, which are customarily tossed on the floor of the bar when you're done smoking it. I LOVED Spain! (The "meals" we loved the best were the tapas, in little, smokey bars. But that's another story. EDIT: I found this photo, not of breakfast, although the stout hearted might eat it. It was a lunch snack at the small town of Benia de Onis, Asturias. What you see are tortas de maíz— fried corn cakes (there's a Mexico connection! ), dressed with honey and crumbles of the local pungent blue veined Queso Cabrales. There are also some less interesting croquetas in the photo.